Welcome to the 2017 Frederick Hustlers 11U Team site. We are playing in 12-13 tournaments this year from March thru the middle of July. We are also participating in weekday scrimmages starting in late April thru June. 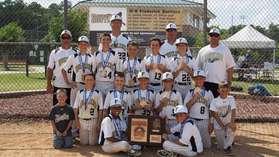 Our 2016 10U team was very successful, winning 32 of 48 games, and capturing 3 tournament titles, including the 10U-A division of the Maryland Stars and Strikes. I you have any questions or interest in the team, please reach out to ronniezr@comcast.net, or call Ronnie at 717-521-9995. 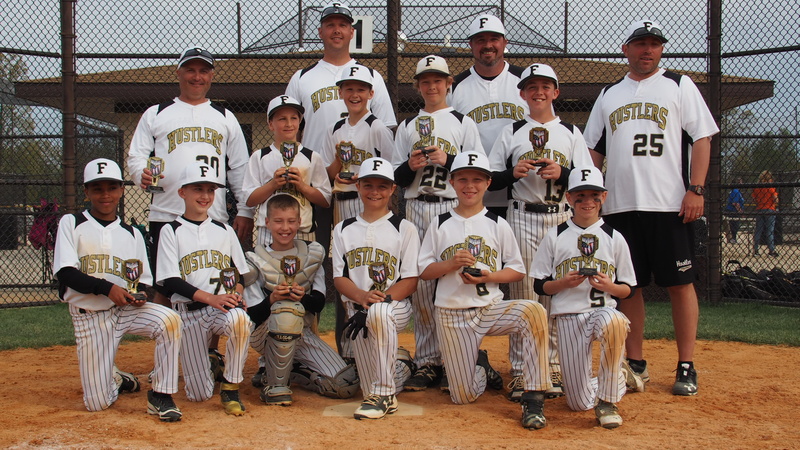 The 11U Hustlers traveled to Greencastle to play in the Mason Dixon Showdown tournament this past weekend. Saturday was ugly, as the Hustlers played in rainy weather both games. The young Hustlers came out of the gate strong with a big 15-0 shutout of the Winchester Nationals. Landon Johnson pitched shutout baseball for 3 innings, as the Hustlers bats dominated this game. Camren Baker, Ryan Jones, Jaxson Wood, and Andrew Raymond each had 2 hits to lead the way. Camdyn Keller homered for the Hustlers also. Game 2 was dominated by pitchers on Saturday. KMS threw 2 big lefties, and they held the Hustlers to 3 hits, while Aiden Dubetsky and Ryan Jones pitched great baseball, combining to allow no walks and 9 strikeouts in the game. The big inning for the Hustlers was in the 5th, trailing by a score of 2-1, when Ryan Jones batted with 2 outs and with 2 strikes, lifted a 2 run double to deep right center field to bring home Landon Johnson and Aiden Dubetsky home, giving the Hustlers a 3-2 lead. Jones shutdown KMS in the 5th & 6th on the mound, striking out 5 batters, and the Hustlers won the game by a score of 3-2. Landon Johnson had 2 hits for the Hustlers in the game. The Sunday action started with the Hustlers taking down the Williamsport Angels by a score of 14-4. Camren Baker, Aiden Dubetsky, Jaxson Wood, and Logan Malachowski each had 2 hits to lead the way. Andrew Raymond pitched 3 innings and Camren Baker closed it out on the mound. The semi-final game on Sunday had the Hustlers going against the Loudoun County Aces Blue team. This team knocked the Hustlers out of Long Horn tournament back in March. It looked as though they would knock the Hustlers out here also, as they led most of the game, and had a 9-5 lead entering the 5th inning, which would be the last inning due to the time limits. However, the Hustlers woke up in the 5th, and plated 5 runs, and won the game by a score of 10-9. Aiden Dubetsky and Ryan Jones each had 3 hits to lead the way, while Andrew Raymond, Gavin Hughes, and Killian Stair each had 2 hits. Ryan Jones and Logan Malachowski worked on the mound in this game. The Championship game had the Hustlers and the Winchester Nationals in a tilt that was not close to the Saturday morning matchup. The Nationals had just put up 14 runs on KMS in the semi-finals, and they didn’t stop hitting in this wild game. The Nationals led 7-0 after 2 innings, but the Hustler bats woke up in the 3rd, putting up a 10 spot. However, the Nationals kept hitting and had a 13-12 lead, but the Hustlers put up 7 in the bottom of the 5th. The Nationals didn’t go away silently, scoring 4 runs with 2 outs in the last inning, but the Hustlers held on to win by a score of 19-17, in an ugly game. Jaxson Wood led the way with 3 hits, while Camren Baker, Ryan Jones, Andrew Raymond, Gavin Hughes, and Killian Stair each had 2 hits. Logan Malachowski, Aidan Simmons, Landon Johnson, and Aiden Dubetsky all pitched in the game. Leading hitters for the tournament, Ryan Jones (.643), Andrew Raymond (.600), Gavin Hughes (.600), Killian Stair (.600) , Landon Johnson (.462), Jaxson Wood (.438), Camren Baker (.429), Aiden Dubetsky (.429), Logan Malachowski (.333). 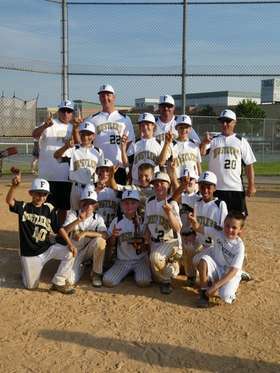 The 11U Hustlers competed in the “Battle of the Bats” tournament this past weekend in Frederick. Game 1 on Saturday had the Hustlers facing the Hub City Hammers. This was a tight game until the 5th inning, when the Hustlers put up 10 runs and won the game by a score of 13-4. Aiden Dubetsky had a hot stick, with 4 hits, while Camren Baker had 3, and Jaxson wood had 2 hits. Baker threw threw innings, and Gavin Hughes threw the last 2 innings on the mount. Game 2 had the Hustlers facing the Eagle Baseball Club. The Hustlers scored in every inning to take this contest by a score of 13-3. Logan Malachowski had 3 hits, including 2 Home Runs, one being a Grand Slam. Aiden Dubetsky, Gavin Hughes, and Aidan Simmons each had 2 hits. Aiden Simmons threw 3 shutout innings, and Jaxson Wood threw 1 inning for the Hustlers. The Hustlers started Sunday as the 2 seed, and were matchup up against the Fallston Cougars. The Hustlers scored 5 in the 3rd, and 6 in the 4th, to take this game by a score of 12-4. Camren Baker and Logan Malachowski each had 2 hits in the game, while Andrew Raymond hit a home run. Andrew Raymond pitched 4 innings, and Aidan Simmons finished it off on the mound. The Semi-final game had the Hustlers facing the HCYP Raiders from the Crab league, who had just beaten the Mid-Atlantic Red Sox from the Crab League. The Hustlers dominated this game from the start, and won by mercy rule by a score of 13-1. Aiden Dubetsky and Andrew Raymond each had 2 hits to lead the way, while Landon Johnson and Gavin Hughes each hit home runs. Logan Malachowski threw a gem over 4 innings, allowing only 2 hits. The Championship game had the Hustlers facing KMS, who just beat API from the Crab league by 1 run in the semi-finals. This was a tight game, with the Hustlers leading by a score of 2-1 after 4, and 4-1 after 5 innings. However, in the 6th, the wheels feel off, and KMS won the game on a 3 run walk off home run. Landon Johnson had 2 hits for the Hustlers, while Logan Malachowski hit a home run. Ryan Jones was very good on the mound for 5 innings, before the big walk off hit in the 6th. Leading hitters for the weekend, Aiden Dubetsky (.667), Logan Malachowski (.545), Camren Baker (.467), Killian Stair (.417), Jaxson Wood (.400), Andrew Raymond (.400), Aiden Simmons (.400), and Gavin Hughes (.385). 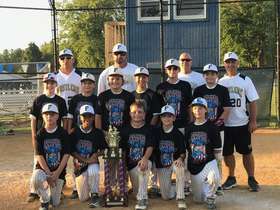 The 11U Hustlers competed in the Maryland Stars and Strikes tournament this past weekend. The 11A bracket was loaded with good teams from Maryland. Saturday started off with the Hustlers playing KMS Baseball Academy. They Hustlers jumper out to a 7-0 lead, only to see KMS come back and tie it in the 2nd, and take the lead with 2 more in the 3rd. They Hustlers battled back though, with 4 in the 4th, and 1 more in the 5th, and won the game by a score of 12-10. Ryan Jones, who doubled, and Ryan Maxey each had 2 hits in the game for the Hustlers. Logan Malachowski started on the hill, while Ryan Maxey came on in relief, and Ryan Jones closed it out on the mound. Game 2 had the Hustlers facing the Olney Pirates, and this turned into one of the best games of the year. This was a defensive struggle and pitcher’s duel the entire game. The Hustlers only managed 4 hits in the game, while Olney had 7. There were nothing but zeros on the scoreboard going into the 6th inning, when Olney plated an unearned run to take a 1-0 lead. Gavin Hughes led off the bottom of the 6th with a single to center field. Killian Stair then bunted him over to second, and Hughes then advanced to 3rd on an errant pickoff play. Aiden Simmons then drove a line drive to right field to tie the score. The game ended in a 1-1 tie. Aiden Dubetsky pitched 4 great innings, and Landon Johnson added 2 more solid innings in relief. Hughes, Ryan Jones, Jaxson Wood, and Andrew Raymond each had 1 hit in the game for the Hustlers. Saturday’s play earned the Hustlers a 5 seed out of 16 going into Sunday, and had the Hustlers playing the WHC Renegades. The Hustlers scored in each of the 4 first innings, and went on to win this game by a score of 9-5. Aidan Simmons threw 4 innings, allowing 5 runs. Andrew Raymond closed the game out with 2 solid innings of scoreless relief work on the mound. Killian Stair had 2 hits, while Ryan Jones, Ryan Maxey, Landon Johnson, Jaxson wood, and Andrew Raymond each had 1 hit. Maxey, Raymond, and Wood each doubled. Game 4 of the weekend had Hustlers facing the Southern Maryland Orioles. This was a long game with lots of runs scored. This was a 4-4 game after 1, and 8-6 game after 2. The Hustlers advanced the lead to 12-6, but the Orioles plated 6 runs in the 5th to tie the game. Due to the time limit, the 6th inning started out like extra innings, using international rules, and a runner on 2nd. Killian Stair started at 2nd based, and proceeded to steal 3rd. Aidan Simmons then put down a sacrifice bunt, and beat it out to 1st base, and then stole 2nd on the next pitch. Camren Baker then put down a good bunt scoring Stair and advancing Simmons to 3rd for a single. Baker advanced to 2nd on a passed ball. Aiden Dubetsky then hit a Sac Fly, to bring home Simmons. Ryan Jones then hit a bomb to right field for a triple scoring Baker. Ryan Maxey then doubled to left field, scoring Jones, giving the Hustlers a 16-12 lead. Jones shutdown the Orioles in the last inning and the game ended 16-12 in the Hustlers favor. Jones, Maxey, and Stair each had 2 hits, while Baker, Dubetsky, Logan Malachowski, and Simmons each had 1 hit. Landon Johnson pitched 1 inning, Baker when 3 & 1/3, Gavin Hughes 1/3, and Ryan Jones went 1 & 1/3 on the hill. The Semi-final game had the Hustlers facing the Sykesville Cyclones, who just beat KMS Baseball Academy. The Hustlers got great pitching from Ryan Maxey and Logan Machowski in this one. Maxey threw 2 innings of 1 run baseball, while Malachowski dominated Sykesville over 4 innings, allowing only 1 hit of scoreless baseball. The Hustlers won this game by a score of 4-1 to advance to the championship game. Aiden Dubetsky had 2 hits, while Landon Johnson, Logan Malachowski, Killian Stair, and Aiden Simmons each had 1. The finals had the Hustlers facing the Lake Shore Gray Sox, who beat Catoctin to get to the finals. Once again, the Hustlers played great defense and got great pitching. Each team scored 2 in the first. The Hustlers took a 3-2 lead in the 2nd, only to see the Sox tie it in the 3rd. The Hustlers plated a run in the 5th to take a 4-3 lead. Aiden Dubetsky pitched 3 solid innings allowing only 3 runs. Ryan Jones closed it out throwing 3 scoreless innings of 3 hit baseball. The Sox had a runner on 3rd base with no outs in the 6th inning, but Jones struck out the next 2 batters before inducing a flyball out to shortstop Aiden Dubetsky to end it, with the Hustler winning the championship by a score of 4-3. This was the second year in a row this team won this tournament, as the Hustlers won the 10A bracket in 2016. Jones had 3 hits in the game, Dubetsky, Ryan Maxey, and Andrew Raymond each had 2 hits. Camren Baker, Logan Malachowski, and Aidan Simmons each had a hit. Leading hitters in the tournament were Ryan Jones(.643), Killian Stair(.462), Ryan Maxey(.438), Aiden Dubetsky(.375), Andrew Raymond(.333), Logan Malachowski(.333), and Aidan Simmons (.300). 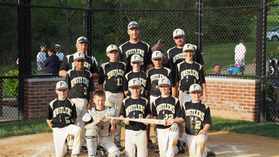 The 11U Hustlers participated in the Armed Forces Slugfest tournament held in Frederick, Maryland this past weekend. Saturday’s first tilt had the Hustlers facing Edge Baseball out of Greencastle, PA. The Hustlers came out swinging, scoring 3 in the 1st, 4 in the 2nd, and 15 in the 3rd, and went on to win via the mercy rule by a score of 22-0. The Hustlers had 16 hits, including 7 extra base hits. Aiden Dubetsky, Andrew Raymond, and Gavin Hughes each had 3 hits, while Ryan Jones & Aidan Simmons each had two hits. Raymond doubled and tripled, while Hughes hit a Home Run. Dubetsky, Landon Johnson, Jones, and Logan Malachowski each doubled. Camren Baker reached base all 4 times via bases on ball & hit by pitch, scoring 4 runs. Dubetsky had 5 runs batted in, while Raymond had 4, and Jones & Hughes each had 3. Simmons threw 2 shutout innings, and Baker threw 1 shutout inning. Game 2 Saturday had the Hustlers facing the Chesapeake Orioles. The Hustler bats stayed hot in this game also, with a repeat 16 hits in the game. The Hustlers jumped out to a 4-0 lead after 3 innings, only to see the Orioles put up 4 in the top of the 4th. However, the Hustlers matched this in the bottom of the 4th with 4 more runs, and added 3 more in the 5th, to take the win by a score of 11-4. Andrew Raymond continued his hot hitting, with 3 hits, including a double and a Home Run. Camren Baker, Ryan Jones, Landon Johnson, Killian Stair, and Aidan Simmons each had 2 hits. Aiden Dubetsky and Logan Malachowski each doubled. Malachowski dominated the Orioles for 2 innings, allowing no hits or runs with 2 K’s. Johnson shutdown the Orioles in the 3rd, but ran into trouble in the 4th due to a fielding error and a couple of walks. Andrew Raymond came on to get out of the jam in the 4th, and pitched a scoreless inning in the 5th, Dubetsky finished it off by throwing a hitless, scoreless 6th, striking out 2 batters. Saturdays play put the Hustlers into Sunday play as the number 2 seed out of 12 teams, and getting a first round bye. The semi-final game had the Hustlers facing a very good GoWag’s team that had just taken down the Mid-Atlantic Red Sox by 1 run earlier in the morning. The GoWag’s bats came out steaming in the first, as they put a 4 spot on the board off Hustler starter Ryan Jones. However, the Hustlers matched that with 4 runs in the bottom of the 1st. The GoWag’s added a run in the top of the 2nd, and added 3 more in the top of the 4th to take a commanding 8-4 lead into the bottom of the 4th. That is when the Hustlers went to work, scoring 2 runs to make it a 8-6 game. The fifth inning would be the last due to the 1 hour 45 minute time delay. Aidan Simmons shutdown the opposition in the top half of the 5th. The bottom of the 5th inning for the Hustlers was a good example of the entire season. This team just doesn’t quit. With 1 out in the last inning, Gavin Hughes got this started with a long double to left field. After a flyout to the right fielder and 2 outs, Aidan Simmons then doubled to right center scoring Hughes to make it 8-7. Camren Baker then laced a single to right field scoring Simmons to tie it, and advanced to 2nd on the throw. Aiden Dubetsky then walked. The GoWag’s elected to change pitchers, and on the very first pitch, Ryan Jones hammered a walk off line drive into right center field to bring home Baker for the game winner, and the Hustlers won the game by a score of 9-8. Baker, Dubetsky, Jones, Hughes, and Simmons each had 2 hits in the game, as the Hustlers were outhit 14-13. Aidan Simmons threw 3 solid innings of 3 run baseball for the Hustlers. The Championship game had the Hustlers facing Fielder’s Choice, who just beat a good Lake Shore Gray Sox team in the semi-finals by a score of 8-7. This was a pitcher’s duel going into the 4th, as the Hustlers held a 1-0 lead after 3. However, the Hustler bats woke up in the 4th and 5th innings, scoring 7 runs in the 4th, and 9 more in the 5th, and the Hustlers dominated the Championship game by a score of 17-0. The big story in this game was Aiden Dubetsky. Dubetsky threw a no-no over 5 innings, allowing no hits, no walks, striking out 7 batters. Camren Baker, Ryan Jones, and Gavin Hughes each had 2 hits, while Dubetsky, Jaxson Wood, Andrew Raymond, Killian Stair, and Aidan Simmons each had 1. Logan Malachowski had a 3 run double . Leading hitters for the weekend: Ryan Jones (.666), Aidan Simmons (.636), Andrew Raymond (.571), Aiden Dubetsky (.538), Gavin Hughes (.538), Camren Baker (.500), Landon Johnson (.400), Killian Stair(.364), Jaxson Wood(.300), and Logan Malachowski (.300). 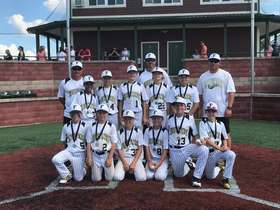 The 11U Hustlers made trip to Rocky Mount, North Carolina to compete in the Top Gun Summer World Series. There were 64 11U teams playing. The Hustlers competed in Division 1, the most competitive division in the 11U age group, where 19 teams squared off. The first of 4 pool games didn’t start well for the Hustlers, as they fell behind the Pirates Baseball Club out of North Carolina by a score of 7-1 after 3 innings. The Hustlers battled, but couldn’t make it all the way back and lost by a score of 10-8. The Hustlers had 4 costly errors leading to 7 unearned runs. Logan Malachowski pitched very well in this one, but the Hustler defense did little to help him. Landon Johnson and Aidan Simmons also pitched for the Hustlers. Ryan Jones and Andrew Raymond each had 2 hits to lead the way for Hustlers. Game two on Saturday had Hustlers facing Rawlings Prospects out of North Carolina. The Hustlers jumped out to a 7-2 lead after 2 innings. However, that lead evaporated as the Prospects took the lead by a score of 8-7 going into the bottom of the 5th. The Hustlers responded with 2 in the bottom of the 5th on RBI singles by Hutson Trobaugh and Andrew Raymond. Ryan Jones then shutdown the Prospects in the 6th inning, and the Hustlers won this game by a score of 9-8. Trobaugh had 3 hits, while Jones, Camren Baker, and Brady Romsberg each had 2. Trobaugh and Romsberg each doubled. Aiden Dubetsky, Trobaugh, Romsberg, and Jones all pitched in this game. Game 3 in Pool Play had the Hustlers facing the Carolina Titans. This was another nail bitter. The Hustlers scored 2 in the first, only to see the Titans tie it up in the 3rd at 3-3 on 2 solo Home Runs off Hustler Starter Ryan Jones. This game was knotted at 3 until the 6th, when the Hustlers took control. Aidan Simmons got things started in the 6th, with a bunt single, then stole second, and then advanced to 3rd base on a passed ball. Simmons scored on an error in the outfield to give the Hustlers a 4-3 lead. Brady Romsberg shutdown the Titans in the 6th, and the Hustlers won by a score of 4-3. Jones pitched the first 3 innings, while Romsberg was lights out over the last 3 allowing no runs. Aiden Dubetsky, Hutson Trobaugh, Jones, Andrew Raymond, Simmons, Jaxson Wood, Killian Stair, Romsberg, and Gavin Hughes each had 1 hit in the game. Dubetsky and Hughes each doubled. Game 4 of Pool Play had the Hustlers facing the North Carolina Wildcards. The Wildcard pitchers dominated the Hustler bats in this one, as the Hustlers only had 4 hits in the game, and went on to lose by a score of 5-2. Aiden Dubetsky, Jaxson Wood, Killian Stair, and Brady Romsberg each had 1 hit in the game. The Hustlers were seeded 9th out of 19 teams, just outside of the gold bracket seeding, but earned the Number 1 seed in the Silver bracket on Sunday. The Hustlers got a bye, and were paired up again with the Carolina Titans in the Semi-final game. The Hustlers quickly went to work here, scoring in each of the first 4 innings to take a 7-1 lead after 4, and went on to win this game by a score of 7-2. Aiden Dubetsky threw 4 very good innings, and Aidan Simmons closed it out on the mound for 2 solid innings in relief. Camren Baker, Andrew Raymond, and Gavin Hughes each had 2 hits in the game. Hughes had 2 big doubles and 4 RBI’s. The Championship game had the Hustlers facing the Rawlings Prospects again. Again, this game was very tight the whole way. This was another one of those games that showed the same kind of heart and effort the Hustlers have had all year long. Each team scored 2 in the first, but Rawlings added 1 in the second and 3rd, to take a 4-3 lead after 3. The score remained this way until the bottom of the 6th. The Hustlers have had many comeback wins this year in tournaments, and this game would be no different. After Aiden Dubetsky grounded out, Camren Baker got things rolling with a bunt single, his 3rd hit of the game. Baker then stole second base, and then also stole 3rd base. Hutson Trobaugh then walked. On a pick off play to first, Trobaugh took off for 2nd, and made it, giving the Hustlers runners at 2nd and 3rd with 1 out. Ryan Jones was then intentionally walked, to bring up the hero, Andrew Raymond. Raymond hit the first pitch he saw over the left fielders head, scoring both Baker and Trobaugh, giving the Hustlers the Silver bracket Championship and a win by a score of 5-4. Logan Malachowski, Trobaugh, and Raymond each pitched 2 innings, and all threw very well. This was a great tournament, competition was good. The Hustlers earned a free berth to the Top Gun Summer National Championship in South Carolina with the win. Leading hitters for the weekend: Andrew Raymond(.545), Killian Stair(.500), Ryan Jones(.462), Brady Romsberg(.444), Hutson Trobaugh(.429), Jaxson Wood(.400), Gavin Hughes(.375), Camren Baker(.357), and Aidan Simmons(.333). 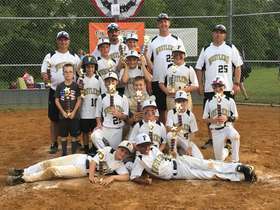 The 11U Hustlers competed in the Upper Chesapeake tournament this past weekend. Game one had the Hustlers facing the Bel Air Braves. Bel Air scored 3 in the bottom of the 1st, only to see the Hustlers take the lead in the 2nd with 4 runs. The Hustlers were not ready to play baseball in this one, as the bats were dead and only had 4 hits in the game. The Hustlers held a 4-3 lead going into the 4th, when things fell apart due to very lousy defense. The Hustlers committed 4 errors in the 4th inning, allowing 7 unearned runs, and went on to lose by a score of 10-4. Ryan Jones pitched the first 3 innings, and Ryan Maxey pitched in the 4th for the Hustlers. Andrew Raymond, Ryan Maxey, Landon Johnson and Aidan Simmons each had 1 hit for the Hustlers. Game 2 had the Hustlers facing the WHC Renegades. The Hustler bats woke up in this one, as they used a 13 hit attack to take a 10-2 victory over the Renegades. Logan Malachowski threw 3 shutout innings, while Andrew Raymond went 2& 1/3 innings on the mound, and Aidan Simmons closed it out with 2/3 of an inning on the hill. Ryan Jones and Malachowski each had 3 hits, while Simmons had 2. Malachowski and Jaxson Wood each doubled. There were 24 teams competing and unfortunately the poor showing in the first game put the Hustlers into Sunday as a 9 seed, just outside of the top 8. The Hustlers were put into the Silver bracket for Sunday starting as the number 1 seed. The Hustlers game 1 on Sunday was versus Severna Park. The Hustlers jumped out to a 9-0 lead after 3, and went on to win this game by a score of 12-2 via the mercy rule. Ryan Jones, Carlos Caraballo, Ryan Maxey, Jaxson Wood, and Logan Malachowski each had 2 hits to lead the Hustlers. Jones had 2 doubles, while Malachowski had 1. Landon Johnson pitched 3 shutout innings, while Camren Baker threw 2 innings, and gave up no earned runs. Game 2 on Sunday had the Hustlers facing the Shutdown Orioles. The Hustlers did the shutting down in this one, as they won the game via the mercy rule by a score of 12-0. Aiden Dubetsky and Jaxson Wood combined to throw a no hitter. Dubetsky threw 3 flawless innings, and Wood closed it out. Camren Baker, Ryan Jones, and Aidan Simmons each had 2 hits in the game. Jones had 5 RBI’s in the game, while Carlos Caraballo and Landon Johnson each doubled. The Championship game had the Hustlers facing Savage. The Hustlers took control of the game quickly scoring 11 runs in the first 3 innings, and went on to win the Silver bracket championship by a score of 11-0. Three Hustler pitchers combined to throw a second no hitter in a row. Aidan Simmons threw 2 innings, while Killian Stair, and Carlos Caraballo each threw an inning. Ryan Jones, Andrew Raymond, Landon Johnson, and Simmons each had 2 hits in the game. Carmen Baker and Ryan Maxey each doubled, while Raymond tripled, and Caraballo hit a Home Run in the game. Leading hitters for the weekend were: Aidan Simmons (.727), Ryan Jones, (.667), Aiden Dubetsky (.500), Ryan Maxey (.500), Landon Johnson (.455), Logan Malachowski (.417), Jaxson Wood (.400), Raymond (.364), Carlos Caraballo (.364), and Camren Baker (.308). 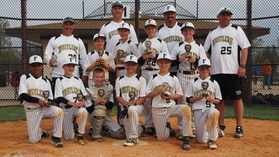 The 11U Hustlers traveled to Windber, PA, to compete in the Fireworks Classic, at the new Iron Horse Complex. For the second consecutive weekend, the Hustlers came out flat for the first game. Matched up against the Pittbulls, the Hustlers could not match the opposition and lost the first game by a score of 10-4. The Pitbulls had 10 hits off of Hustler pitching. Ryan Jones, Aidan Simmons, and Landon Johnson pitched on the mound. Jones had 2 hits including a double for the Hustlers, while Carlos Caraballo and Gavin Hughes each doubled also. Game 2 had the Hustlers facing Wheeling Post 1. The Hustler bats woke up in this game, and the Hustlers had 14 hits in 3 innings, and went on to win the game by a score of 15-0. Aiden Dubetsky threw 3 innings of no hit baseball. Ryan Jones and Logan Malachowski each had 3 hits, while Dubetsky, Carlos Caraballo, and Landon Johnson each had 2 hits. Malachowski and Simmons each doubled. Game 3 on Sunday opened with the Hustlers as the number 2 seed, again facing the Wheeling Post team from West Virginia. The Hustler bats stayed hot, as they put up 12 hits over 3 innings, taking advantage of 5 errors by the opposition, and winning the game by a score of 17-2 via the mercy rule. Landon Johnson threw 3 innings of 2 run baseball on the hill for the Hustlers. Ryan Jones had 3 hits, while Camren Baker, Aiden Dubetsky, and Carlos Caraballo each had 1 hit. Caraballo and Killian Stair each doubled, while Dubetsky doubled twice. Gavin Hughes hit a tape measure home run in this game. The semi-final game had the Hustlers facing the host Iron Horse Mustangs. The Hustler bats remained hot in this matchup, as they had 13 hits and scored in each of the 5 innings to take this game via the mercy rule by a score of 11-3. Carlos Caraballo had 3 hits to lead the way, while Ryan Jones, Andrew Raymond, and Landon Johnson each had 2 hits. Jones, Raymond, and Gavin Hughes each doubled. Johnson and Jaxson Wood each hit Home Runs in the game. Logan Malachowski threw 4 innings of 3 run baseball, while Aiden Dubetsky threw a scoreless inning to close it out. The Championship game had the Hustlers facing Doubleday’s Dubois. The game did not start well for the Hustlers. The opposition scored 2 in the first and 4 in the second, and led 6-1 after 2 innings. As has been the case all year, this young Hustler team never quits. The Hustlers put up a booming 10 spot in the 3rd, to take an 11-6 lead, and went on to win the championship game by a score of 12-8. Carlos Caraballo started on the hill for the Hustlers, but could not get out of the second inning. Aidan Simmons came on in relief and threw 2 & 2/3’s of scoreless relief. Andrew Raymond threw in the 5th, and Aiden Dubetsky threw a scoreless 6th inning to close it out for the Hustlers. Dubetsky, Ryan Jones, Logan Malachowski, Gavin Hughes, and Jaxson Wood each had 2 hits. Hughes, with 4 RBI’s, and Wood, each had Home Runs in the game. There were many hot bats over the weekend for the Hustlers. Ryan Jones hit a blistering (.857) for the weekend, reaching base every at bat in 5 games with the exception of 1 at bat. Gavin Hughes (.625), and Carlos Caraballo (.600) were also very hot. Other leading hitters were: Aiden Dubetsky (.583), Logan Malachowski (.538), Landon Johnson (.500), Killian Stair (.429), and Andrew Raymond (.400). Hughes, and Jaxson Wood each hit 2 home runs, while Johnson hit 1. Aiden Dubetsky and Aiden Simmons were lights out on the hill for the Hustlers. The 11U Hustlers traveled to Kiwanis Park this past weekend to participate in the HCYP Summer Clash. This would be the last tournament for the 11U team. Friday nights tilt had the Hustlers facing the WHC Renegades from the MABA Division 1 league. This was a tight game, with WHC scoring 1 in the first, but the Hustlers battled back in the 1st scoring 2, and led 4-1 going into the 4th. However, WHC erased that led by scoring 3 in the 4th to tie it. The game was knotted at 4, until Gavin Hughes launched a 2 out Solo Home Run to left field, giving the Hustlers a 5-4 lead. Hustler pitching closed the door, and the Hustlers won this by a score of 5-4. Aiden Dubetsky threw 3 innings, allowing no earned runs. Logan Malachowski labored a little, pitching the 4th. Lefty Aidan Simmons threw 2 shutout innings to close the door on the Renegades. Camren Baker & Gavin Hughes each had 2 hits to lead the Hustlers. Game 2 on Saturday had the Hustlers facing the Arlington Storm. The Hustlers jumped out to an 8-1 lead after 3 innings, only to see this evaporate, as the Storm scored 3 runs in the fourth, and 3 more in the 5th, with help from some sloppy defense to make it 8-7. Jaxson wood had a bases loaded base clearing double in the 5th to give the Hustlers an 11-7 lead going into the bottom of the frame. However, the Storm battled back, scoring 3 runs. The storm had runners at 1st and 3rd, with 1 out, when Aidan Simmons came in to pitch. Simmons induced a ground ball to 3rd basemen Ryan Maxey, who threw home to gun down the runner trying to advance. The crafty Simmons then struck out the next batter, closing the door and giving the Hustlers an 11-10 win. Ryan Maxey threw 2 innings of baseball, while Jaxson Wood threw in the 3rd, and Ryan Jones struggled over 2 & 1/3 inning before Simmons came on to close the door. Jaxson Wood had 3 hits to lead the Hustlers, while Camren Baker and Logan Malachowski each had 2 hits. Friday and Saturday’s play put the Hustlers into Sunday as the 2 seed out of 12 teams. The Hustlers got paired up against a very formidable 10U team from HCYP, that had just beaten Catonsville, and already mercy ruled the Arlington Storm a day earlier. The Hustlers took care of business in the 1st, scoring a season high 11 runs in the first, and adding 5 more in the second, to take the game by the mercy rule and a score of 16-1. Ryan Jones, Carlos Caraballo, Ryan Maxey, and Killian Stair each had 2 hits in the game. Aiden Dubetsky, Andrew Raymond, and Jaxson Wood each doubled. Andrew Raymond threw 2 innings, allowing no earned runs, and Camren Baker pitched a scoreless 3rd for the Hustlers. The win put the Hustlers in the semi-finals versus the Arlington Storm, who won earlier Sunday morning versus the WHC Renegades. The Home team Hustlers scored in every inning to take the semi-final game by a score of 11-1, advancing to the championship game. Camren Baker had 3 hits, while Carlos Caraballo and Ryan Maxey each had 2 hits. Andrew Raymond pitched 3 innings of 1 run baseball, while Caraballo pitched a scoreless 4th. The championship game featured the Hustlers and the Shutdown Orioles. The orioles just came from behind to beat the HCYP raiders from the CRAB league on a walk-off hit. The Hustlers continued to play good baseball, scoring 3 in the 1st, 6 in the 3rd, and 4 more in the 4th, to take this championship game via the mercy rule by a score of 13-3. Aiden Dubetsky pitched all 4 innings, allowing 1 earned run. Dubetsky, Ryan Jones, Ryan Maxey, Jaxson Wood, and Killian Stair each had 2 hits in the game. Carlos Caraballo tripled. Leading hitters for the weekend: Jaxson Wood(.700), Camren Baker(.615), Carlos Caraballo(.583), Ryan Maxey(.583), Aiden Dubetsky(.455), Gavin Huges(.455), Logan Malachowski(.455), Andrew Raymond(.444), Killian Stair(.444), Ryan Jones(.357). 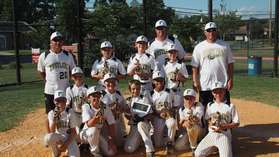 The 11U Hustlers completed a very successful 11U season, with 48 wins, 11 losses, and 1 tie. There were 5 tournament championships, and 2 Silver Bracket championships during the season.